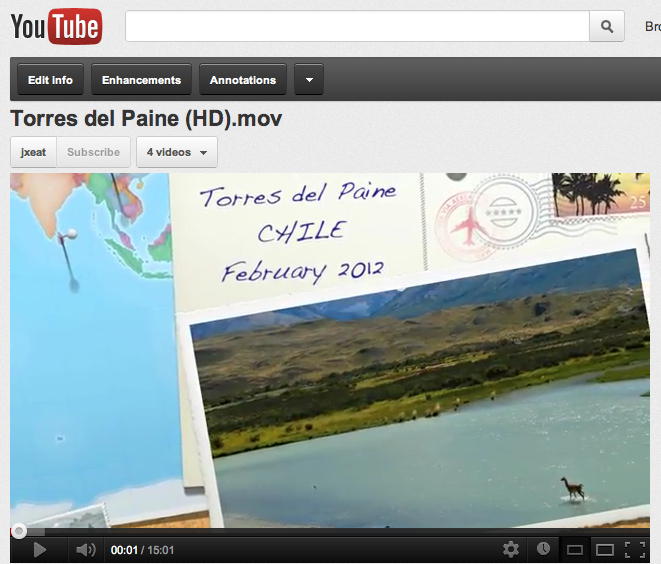 Torres del Paine: the video! Torres del Paine: Final days – bring on the penguins! We enjoyed a beautiful sunrise in P Natales and picked up our rental van to head south to Punta Arenas. We took a side road and enjoyed some great scenery that included lots of geese and an intriguing sculpture in the middle of nowhere that evoked either a giant squid or a baleen whale or something else. We stopped at the Magellanic penguin colony at Seno Otway and enjoyed the hijinks of the penguins as they sheltered on the beach. The colony was in the life cycle stage where the young were making their first trips to sea. So we only saw about 50 penguins of the 10,000 that are reportedly at this colony – the rest were busy chasing fish. But it was fun (and, of course, windy!). Eventually we arrived at our destination: Bahia Inutil and its very unusual colony of King Penguins. These gorgeous penguins normally inhabit oceanic islands, being found by the 100’s of thousands on South Georgia Island, the Malvinas (aka “Falklands”), etc. But, for unknown reasons, some set up shop at this wind-swept beach about 15 years ago. A small “preserve” was set up (the area is fenced and a guard stays there more or less full-time), creating a new destination for eco-tourism out of P. Arenas. Unfortunately, our guide didn’t know that the preserve was closed on Mondays! After some negotiating, the owner was summoned and she was very friendly and eager to meet us (our connections to biology, Science magazine, and National Geographic didn’t hurt, especially the latter). So, we got a “private tour” and enjoyed the 17 or so penguins who were hanging out (the entire colony is about 75 or so; the rest were out fishing). The group included a few chicks, being “tended” (sat on) by males and females alike and peeking out from underneath for an occasional snack. After an hour or so we started the long trip back, highlighted by the tiny (~5 feet?) black and white Commerson’s dolphins that played in the bow wave of the ferry. One more night of seafood and pisco sours and our time in Chile had ended. But a final thrill awaited: a view from above of Torres del Paine as we flew out and then, minutes later, a view of spectacular Mt Fitzroy (in Argentina), perhaps enticing us back for another trek? More pics HERE. We woke up a bit sore from the previous day’s trek (especially Monica, whose feet were in bad condition), enjoyed a fabulous sunrise on the Cuernos, and then five us headed out to the Valle Frances (French Valley), backtracking a bit to Campomiento Italiano. Up from there (the middle point of the “W”) the trail followed a spectacular stream with the snow avalanches continuing above and to the west. We stopped for lunch before reaching an astonishing overlook and then continued a bit further until the day grew late, the wind picked up, and a bit of snow (!) began to fall. We snapped some “hero shots” on some big boulders and then scampered back to Cuernos for an over-priced bottle of Malbec. We packed it all up the next AM (after another gratuitously gorgeous sunrise) and headed east. The weather was fabulous but we could easily tell from the vegetation that 1. this was indeed the dry side of the park; and 2. even so, the plants were really drought-stressed (hence the fire of the previous month). After a disheartening uphill grind and downhill slog to Refugio Chilleno, we rested by two streams, one of water and one of people returning to the Hosteria Torres way down below. The peaks of the famous “Torres” peeked at us from above the ridge, saying: “Why don’t you get up at 4 AM tomorrow and watch the sunrise?” So, we headed off to bed. We spent our second day in the area around Glacier Grey with five us taking a day hike up the trail the passes the side of the glacier (Monica stayed behind to rest her recuperating but sprained ankle). The weather was pretty good and we had a great time working our way up the valley. We especially enjoyed the exciting mountaineering ladders that were in place to exit the deeper gullies. After an enjoyable dinner at the refugio and a restful night, we woke a bit early to head out for the long hike to Refugio Cuernos. This day would be long because the recent fire closed Refugio Paine Grande where we would otherwise have stayed. The day started with light rain and low clouds and we spent the morning hiking along the north side of Laguna Grey. It was spectacular to look back to the glacier and the lake but also a bit depressing to walk through the fire zone. We reached R Paine Grande at lunch time and it was clear that they were lucky that the refugio did not burn down in the fire. After another hour of hiking through the burn area but with clearing weather and the spectacular “cuernos” (horns) in front of us, we reached Campiomento Italiano, beyond the burn zone. A spectacular surprise was the glaciers and icefields on the northeastern face of Cerro Paine Grande which constantly pushed thundering snow avalanches far above us. After some rest at C Italiano, we headed down to Refugio Cuernos on the shores of the oddly named Lago Nordenskjold. Monica especially was glad to reach the refugio – 11 hours of walking with her sore ankle had led her to bruise her big toes and they were really sore. But we all made it through the hardest leg of the trip. Felicitaciones a todos! I have been wishing to visit Torres del Paine ever since 1983 when I was in Punta Arenas and saw a B&W photo of some astonishing mountains nearby. Finally after nearly 30 years I was able to fulfill this dream along with Monica and some friends. 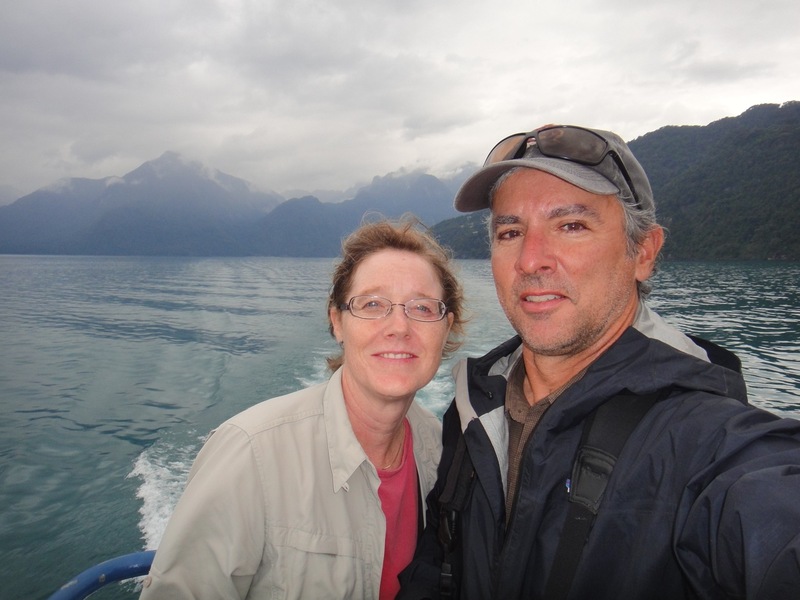 Monica and I travelled from Bariloche to Puerto Varas via bus and spent the night. 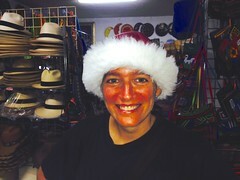 The weather was fine and we enjoyed the Osorno volcano and met our friend Peggy (ASU) and new friend Cheryl (from DC). We enjoyed some seafood at the palafitos restaurants at Angelmo (including another curantos) and then flew to Punta Arenas, arriving late and meeting two other new friends, Matt and Liz (Peggy’s friends, also from DC). Early the next AM our driver Eduardo picked us up and drove us to catch the boat at Laguna Grey in Torres del Paine NP. The icebergs were awesome but the lake crossing was very rough, with rain and heavy winds. After checking into the newly opened (and pretty darn swank) Refugio Grey, we took a quick hike to an awesome overlook of the Grey Glacier. An amazing sunset on the mountains ensued and we headed to bed. 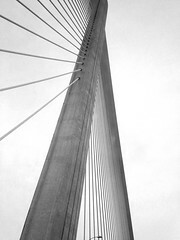 Full pics here. …in beautiful Puerto Varas, Chile. We stayed two nights and, unlike our first trip here in November, the weather was good and we could see the spectacular Osorno and Calbuco volcanoes. We took a full day kayak excursion on the Ronclavi estuary, enjoying a home visit to a nice farm along the coast. 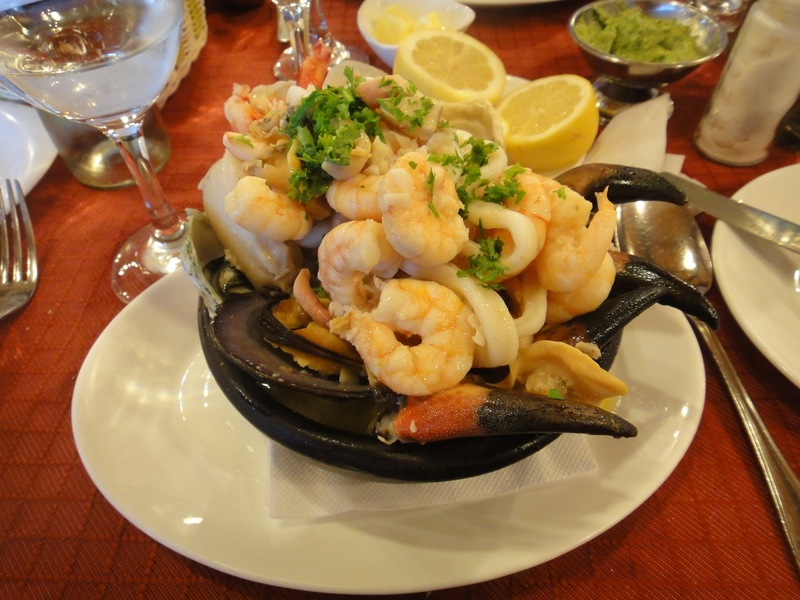 And course we had to visit Las Olla where we had some more spectacular seafood, including the little dish seen below. The second morning we boarded the bus to Bariloche and had a good view of the (hated) Cordon Caulle volcano, still belching ash.